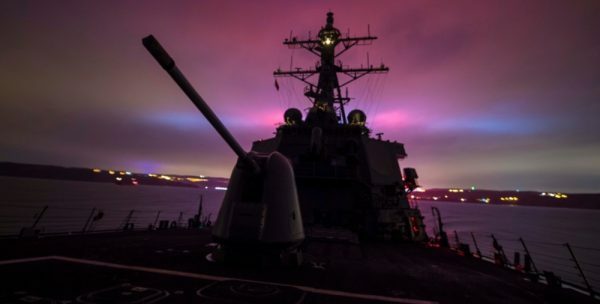 Arleigh Burke-class guided-missile destroyer USS Carney joined USS Ross in the Black Sea to conduct maritime security operations on February 17, the US Navy Sixth Fleet said. A second US Navy ship in the Black Sea is part of an operational schedule that helps sustain the US Navy’s operational presence in the region, the statement said. These naval activities will be conducted in accordance with international law, including the 1936 Montreux Convention which regulates maritime traffic through the Dardanelles and Bosphorus international straits, according to the statement. “Our decision to have two ships simultaneously operate in the Black Sea is proactive, not reactive,” Sixth Fleet commander Vice Admiral Christopher Grady. The last time two US ships operated in the Black Sea was July 2017, during US-Ukraine co-hosted exercise Sea Breeze. US Sixth Fleet ships regularly conduct bilateral and multilateral patrols with US Black Sea partners and allies, including Bulgaria and Turkey, and to conduct exercises with other partners and allies, the statement said. “The continued presence of the US Navy in the Black Sea demonstrates our enduring commitment to regional stability, maritime security of our Black Sea partners, and the collective defence of our NATO allies,” Grady said. In 2017, the US Sixth Fleet participated in three exercises in the Black Sea: Spring Storm, Sea Shield and Sea Breeze. Spring Storm took place from March 13 to 21 2017. US participation in the bilateral, Romania-led exercise focused on tactical unit and staff interoperability between Romanian and US Navy forces. The Harpers Ferry-class dock landing ship USS Carter Hall and the 24th Marine Expeditionary Unit led US efforts in the exercise, which consisted of amphibious operations and maritime defence drills. Sea Shield, a multinational Romanian-led exercise took place from February 1 to 10 2017. US participation included Arleigh Burke-class guided-missile destroyer USS Porter and focused on deploying leading technology and combat capability in support of allies and partners in collective defence of the Black Sea region. The goal of the exercise was to improve the interoperability and combat proficiency of participating units. Exercise Sea Breeze took place from July 10 to 22 2017. Air, land, sea, and amphibious forces from 16 nations participated in the exercise, which focused on warfare areas to include maritime interdiction operations, air defence, anti-submarine warfare, damage control, search and rescue, and amphibious warfare. This exercise occurs annually and is designed to enhance flexibility and interoperability, strengthen combined response capabilities, and demonstrate resolve among allied and partner nation forces to ensure stability in the Black Sea region. Participating US vessels included the Ticonderoga-class guided-missile cruiser USS Hué City (CG 66) and the Arleigh Burke-class guided missile destroyer USS Carney (DDG 64). In addition to the three named exercises, five ships from US Sixth Fleet entered the Black Sea in 2017-2018 to participate in bilateral and multilateral training, and port visits: USS Carney in January 2018; USS Porter from August 18 to September 1 2017; Arleigh Burke-class guided-missile destroyer USS Oscar Austin (DDG 79) in May 2017; USS Carter Hall in March 2017; and Porter from Februar 2 to 11 2017. Port visits provide an opportunity for US forces to build regional relationships and gain appreciation for diverse cultures. Bilateral and multilateral training is aimed toward improving maritime capabilities and reassuring Nato allies and regional partners of the commitment of the US to the alliance and to maritime security and stability in the Black Sea region. “The US Sixth Fleet conducts joint and combined operations, often in concert with allied and interagency partners, in order to advance US national interests along with security and stability in Europe and Africa,” the statement said.